Gigabyte GA-8I945GZME-RH PCSTATS Review - How Does 945GZ Express Handle Core 2 Duo? How Does 945GZ Express Handle Core 2 Duo? The quick answer to the question "How Does 945GZ Express Handle Core 2 Duo?" is not as well as other 945-series chipsets. The Intel 945GZ chipset really bogs the Core 2 Duo down with this 800MHZ FSB limitation. Clearly, fast chips like to have enough bandwidth, and running a nice quick 'Conroe' 600MHz slower than its default speed is kind of counter productive. 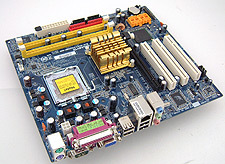 The Gigabyte GA-8I945GZME-RH motherboard is better served by a Intel Pentium 4/D or 'Conroe-L' based Celeron processor which operates at a 800MHz Front Side Bus speed. The Conroe-L in particular, is ideally suited to this chipset, but the processor had not been released at the time of this writing. The Gigabyte GA-8I945GZME-RH motherboard PCSTATS tested today retails for about $115 CDN ($100 US, £55 GBP), making it a great multi-purpose platform for mainstream or value-oriented users. Built on the passively cooled Intel 945GZ Express and Intel ICH7 chipsets, the GA-8I945GZME-RH incorporates an onboard Intel GMA950 videocard and a concise (but not jaw-dropping) set of expansion options. While we've seen that the Intel GMA950 integrated videocard fails miserably at current generation 3D games, it's more than adequate for 2D applications and desktop programs. If you have no interest in gaming and only intend on using your computer for work; surfing the 'net, email, Word and similar Windows XP/Vista based applications, the GMA950 is totally fine. If gaming comes into the cards a little further down the road, the GA-8I945GZME-RH does at least have a PCI Express x16 slot (that runs in PCI Express x4 mode) into which you can install a standalone videocard that can tackle the processing load of a modern 3D game. Incidently, overclocking is not supported here. The feature list for the Gigabyte GA-8I945GZME-RH motherboard is pretty basic; 7.1 channel audio, Gigabit networking, four SATA hard drive / one IDE hard drive support, and the onboard graphics we've already mentioned. Expansion comes care of a PCI Express x16 slot (PCI Express x4 mode only) and three 32-bit PCI slots. With the ability to run up to 2GB of DDR2-533 memory, it's a good idea to install exactly that the first time around. The GMA950 graphics will allocate up to 224MB to itself. The Gigabyte GA-8I945GZME-RH is definitely a well paced mainstream motherboard when it comes to office oriented applications and productivity software (Word, Excel, etc.). Compared to P965 Express based motherboards in benchmarks like SYSMark2004 or Business Winstone 2004, the Gigabyte GA-8I945GZME-RH motherboard stands up satisfactorily, of course the Core 2 Duo processor has a lot to do with this. If you're looking to build a really inexpensive system for simple tasks like the internet, email, and maybe a few office applications the Gigabyte GA-8I945GZME-RH motherboard is adequately powered. If you need a little performance in your PC, you're better off with a 965 Express or even 945P Express based platform. Pg 12. — How Does 945GZ Express Handle Core 2 Duo?